We live in a nation of tea-lovers. Us Brits drink an oceanic 165 million cups of tea every day, adding up to 60.2 billion cups every year! But how much do we really know about the tea we drink? Where does tea come from, how is it grown, and is it fair trade? When you buy fair trade tea, you’re ensuring that the tea farmers, growers, and suppliers are paid a fair price, are given direct access to markets, are treated with respect, and as equals. A lot of the tea drunk around the world is produced on large gardens and estates across India, East Africa, and Sri Lanka, and is picked by employed labourers who work long hours for notoriously low wages. We’re talking acres and acres of tea, being sold to international companies for low prices. Then you have the tea grown on small plantations and smallholder farms, often less that half a football pitch in size. These smallholder farmers find it nearly impossible to compete with the large plantations, and earn a tiny fraction of the price their tea is sold for on the international market, and frequently end up trapped in a cycle of debt and dependence. With each sip of fair trade tea, you know that your favourite hot drink is working to address this global imbalance of power in the world of trade, spanning thousands of miles around the globe. 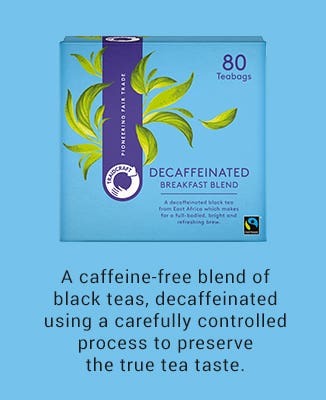 Globally, Fairtrade certified tea is most popular in the UK, with Brits buying over 80% of the total world supply, yet this only accounts for 8% of total tea sales in the UK. It’s time to readdress the balance. Buy fair trade tea. The history of fair trade tea in the UK dates back to 1979, when Traidcraft imported the very first fair trade cuppa into the country. 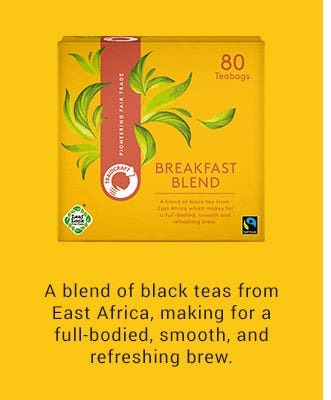 Today, our Fairtrade certified tea comes from carefully selected smallholder farmers in Kenya and Malawi. Back in 1979, our first tea came from a little estate in the south of Sri Lanka. Known as the Waulugala Estate, the farm was owned by a charitable trust, which ran homes and refuges for orphaned children and young people with disabilities. Half of the tea profits went to the Trust, and half was received by the tea workers in the form of an annual bonus. 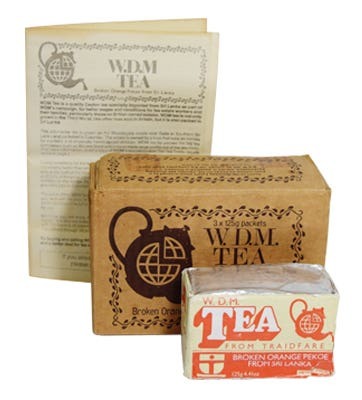 Traidcraft worked together with the World Development Movement – an organisation campaigning for better wages and working conditions for tea farmers and their families – to market the tea under their name, and in 1980 the UK’s first fair trade tea, although it wasn't called fair trade at the time, was showcased in Traidcraft’s second catalogue as ‘WDM Tea: A high quality orange pekoe’, available in a box of three tightly wrapped bundles of dried tea for £1.00. Later in the 1980s, Traidcraft started sourcing from Tamil Nadu and Assam, both in India. The team started to realise that they really needed someone to blend the teas, and they reached out to Ringtons, who were based only a few miles away. To this day, we still partner with Rington’s master blenders to create our everyday ethical brews. In being the first to import and sell fair trade tea, Traidcraft proved that people were keen to pay a premium to make sure the producers had a better deal. Even in the 1980s, tea tasted all that much better for it. Over the years, Traidcraft have partnered with growers in Kenya, Tanzania, Uganda, Malawi, Sri Lanka, Rwanda, and India. Traidcraft is still at the forefront of fair trade tea development. In a world where fair trade tea seems quite commonplace, we’re steaming ahead to find ways to make our fair trade tea even better. In December 2017, Traidcraft was made an official WFTO Guaranteed Fair Trade Organization, which means that in buying Traidcraft Fairtrade certified tea, you can trust that you are buying from a guaranteed fair trade organisation. 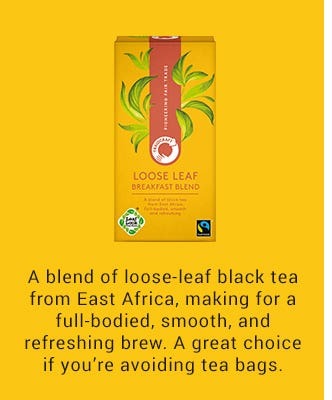 Our tea hasn’t just ticked a box to say that it’s fair trade, it’s living and breathing the ethics every day. 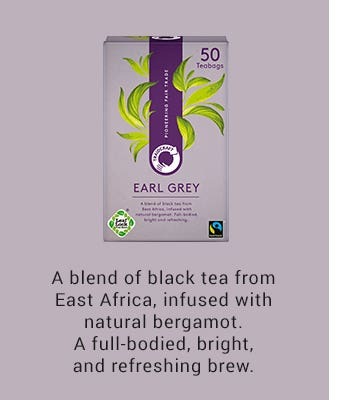 Take a sip of your favourite fair trade loose leaf tea, breakfast blend, decaf tea or fair trade Earl Grey and know that you’re drinking a brew which has travelled thousands of miles from the skilled hands of tea farmers to the cup you cradle in your palm. We’ve worked together with our local tea blender to develop a way to seal in the genuine flavours of the tea. With every sip you experience the true taste of tea. Unlike other teas which are transported in porous paper sacks, Traidcraft fair trade tea is protected from oxygen, moisture, and the elements from origin to pack by Leaf Lock True Taste®, a unique process created to perfectly preserve the genuine taste of tea. Oxygen is removed from the packs at source, the sacks are sealed, and the tea is shipped in a vacuum. Regular tea usually spends 6-8 weeks in-country before even being loaded onto a ship – but we miss out the middlemen and brokers, meaning our vacuum-packed tea reached UK shores in a fraction of the time. Once our fair trade tea arrives in the UK, it’s blended and packed within 8 hours of being in the factory. The transportation sacks are recycled, and the chain is complete. All that’s left to do is taste the smooth, full-bodied flavours, sealed from the bush to your cup, trapped in time. How much tea do we drink each day? The British drink an oceanic 165 million cups of tea every day, adding up to 60.2 billion cups every year! This shows the Brits truly love their tea – as we only drink 70 million cups of coffee each year. How much tea in the UK is fair trade tea? Which is more popular – loose leaf or teabags? 96% of tea brewed in the UK comes in a teabag. What type of plant produces tea? Believe it or not, but all tea is made from the same plant. Whether it's black, oolong, green, white, or pu-erh – all tea is made from the leaves and leaf buds of the camellia sinensis plant. Think of it as the same way that all wine comes from the grape, albeit different varietals. It’s how the leaves and buds are treated, that produce the different types of tea. One of the health benefits from tea is antioxidants. Your body uses antioxidants to protect and heal cells from free radicals. Believe it or not, but tea contains approximately ten times the level of antioxidants found in the equivalent amount of fruits and vegetables! How long have people been drinking tea? The story of tea tells us that people in China have been drinking tea since around 2700 BC, but it’s only since the late 1600s that the brew made it to UK shores. It wasn’t until Traidcraft imported the first fair trade tea in the 1980s that people in the UK started to learn about the origins of the tea we drink, and why we should choose to buy fair trade tea. Are there any record-breaking cups of tea? The world’s largest teabag as recorded by Guinness World Records weighed in at over 551lbs, and measured 10 feet wide by 13 feet high. The teabag was made by Rabea Tea in Saudi Arabia in 2014, and could be used to brew 100,000 cups of tea! Other world records for tea include the world’s largest cup of tea (10 feet tall by 8 feet wide), and the most cups of tea made in one hour – a mind-boggling 1,848 cups of tea, brewed by a team of 12 people.